Rock features are some of the world’s most striking natural wonders. But when Chimney Rock is in the backyard it’s not so inspiring. Mountain tops and rocky glades produce some of the most amazing specimens, from weather-beaten junipers to tiny alpine flowers that the mountain top climate has evolved some incredibly unique plants. Alpine plants love rugged conditions and infertile soil, making them the best choices for rock gardens or converting an uneven outcropping into an attractive landscape. Natural rock formations are all unique but they do follow certain rules. Rocks are never randomly placed, they are consistent geological features formed by the continuous movement of glaciers. Round rocks are usually river rocks that have been smoothed by water. Alpine and cliff rocks are more angular. Find cubes and natural slabs that can be buried so it looks like they are naturally protruding from the ground. Use local stone whenever possible, to blend with the landscape. Study local rock formations, noting the grain of the rocks, positioning of cracked segments, and mixture sizes. 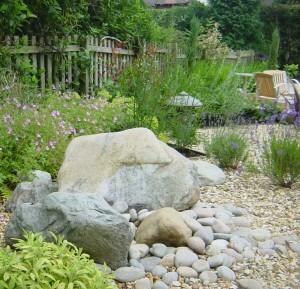 Mimicking nature when placing rocks and choosing plants will make the most effective rock garden. The first step when planning a rock garden should be to consider the logistics of importing tons, literally, tons, of rocks that must be delivered, then moved into place individually, while considering the placement of the rocks in relation to each other. Move very large boulders with a forklift. Always talk to a professional about the logistics of your property before committing to a project. When planning the layout of a rock garden, consider the terrain of your property. For level areas it might be necessary to raise-up part of the ground into a berm where the rocks can be buried. Alternatively, rocks can be buried below the ground level imitating a natural outcropping. Properties with a natural slope have a few more options for laying out a rock garden. A hill can be terraced and connected by a meandering rock path or thin slabs can be wedged into a hill, making a natural planter. A slope is also great for giving the rock garden a little bit of shade. Choose rocks that are large enough to be one-third buried. Rocks need to be stable so the garden can be weeded and maintained. Rocks will naturally move as the soil heaves, so it’s important to have the rocks securely installed or it can be dangerous not only to the plants but to visitors as well. Once the rocks are stable, fill in the cracks and spaces with planting mix, a blend of topsoil, compost and grit, water in the mix, allowing all the nooks and crannies to be filled. Continue adding planting mix until the soil is stable and ready to be planted. Choose compact plants that are heat and drought tolerant. Compact and prostrate evergreens are excellent choices for trees and shrubs in rock gardens. Mediterranean herbs like lavenders and thymes are excellent choices. Perennials that do well in rock gardens include carex, fescue, dwarf fountain grass, penstemon, verbena, and veronica. Succulents and cacti also do well and include aloes, agaves, euphorbias, sedums, and sempervivums.